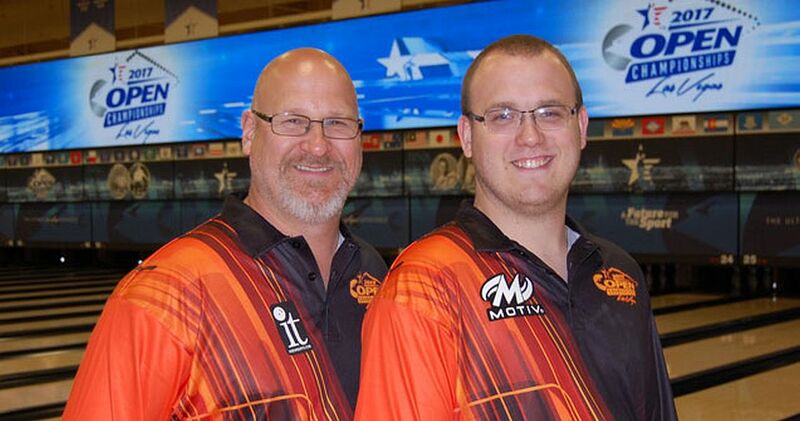 As the highlight of a high-scoring afternoon May 20 at the 2017 United States Bowling Congress Open Championships, USBC Hall of Famer Doug Kent and his son, Jacob Kent, of Newark, New York, cruised into the Regular Doubles lead, posting a 1,425 total at the South Point Bowling Plaza. 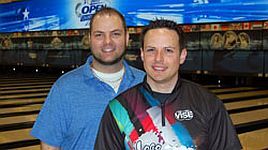 The Kents (pictured above) bested their teammates, Chris Bardol of Brockport, New York, and Tim Pfeifer of Oakdale, Pennsylvania (right, l-r), who grabbed the lead moments earlier with 1,417, propelled by a 300 by Bardol in the second game. Ryan Zagar of Racine, Wisconsin, and Tylor Greene of Davison, Michigan, both former college teammates of Kent at Robert Morris-Illinois, a team Bardol helped coach, previously held the lead in Regular Doubles with 1,409. 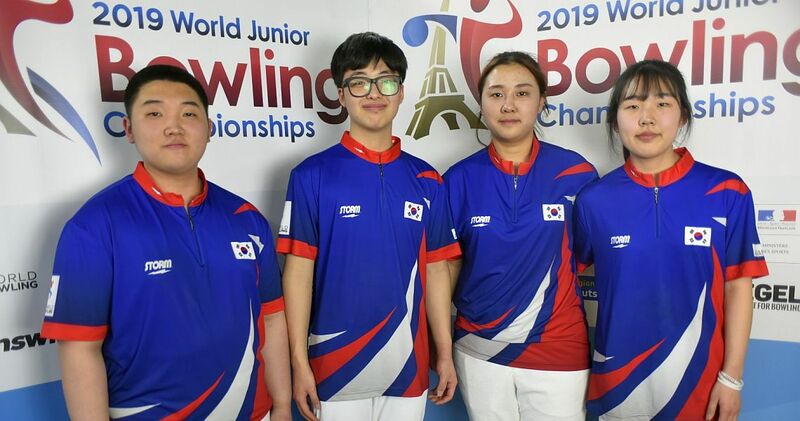 After leaving and converting a 4 pin in his final frame, Jacob Kent struck on his fill ball to complete the performance, something he describes as a total team effort. Doug Kent and Chris Bardol each shot 721 in doubles, while Jacob Kent and Pfeifer had 704 and 696, respectively. Bardol’s 300 was the fourth of the 2017 Open Championships and first in doubles. “It was a lot of fun out there, and we definitely were driving each other along the way, something we did back in college, too,” said Jacob Kent, a 25-year-old right-hander who made his fifth Open Championships appearance. The doubles excitement was one piece of an exciting bigger picture that included a run at the lead in Team All-Events, a top-10 effort in team and two top 10s in Regular All-Events. Collectively known as Rose Bowl Lanes of Rochester, New York (left), the group settled into second place in Team All-Events with a 9,867 total and eighth place in Regular Team with a 3,167 total May 19. Pfeifer, a former member of Team USA and Junior Team USA, as well as the men’s champion at the 2007 Intercollegiate Singles Championships, set the pace for Rose Bowl Lanes with a 2,069 all-events total, which is fifth overall, and he was followed closely by Bardol, the 2010 ISC winner, who is sixth in Regular All-Events with 2,065. Jacob Kent edged his father 2,017-2,012 in the all-events standings, and left-hander Ken Muscato of Canandaigua, New York, rounded things out with 1,704. Team NABR of Fairport, New York (right), leads Team All-Events and Regular Team with 9,957 and 3,266, respectively. 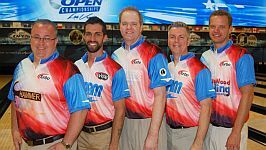 Before competition started May 20 at the 2017 USBC Open Championships, only three perfect games had been rolled through 91 days of competition at the South Point Bowling Plaza. 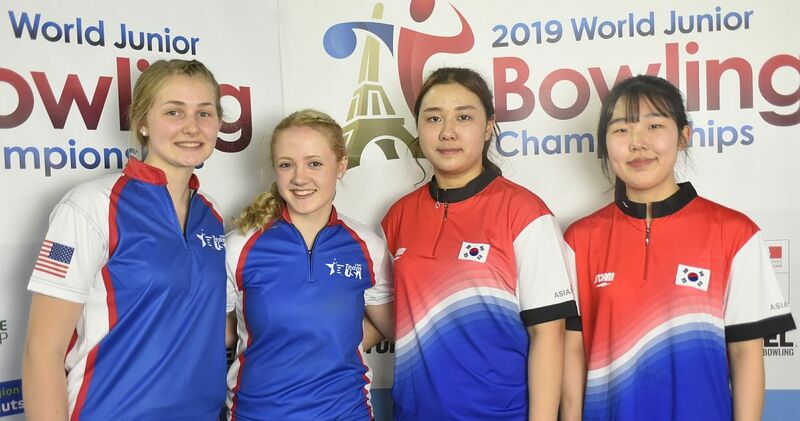 By the end of the 92nd day, the total was up to six, as Marc Massie of Alexandria, Kentucky, and Sheldon Cole of Durham, North Carolina, added their names to the list during the final squad of the day. 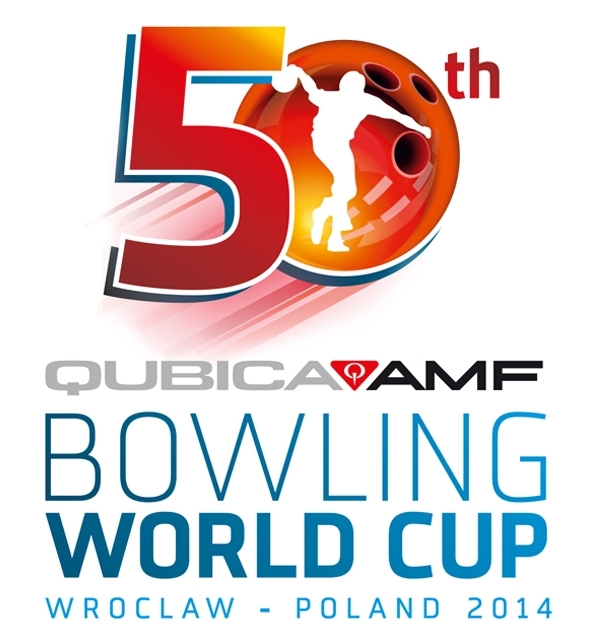 Chris Bardol of Brockport, New York, fired the first 300 of the day during an earlier doubles and singles squad. Massie (above), a 47-year-right-hander who made his 20th tournament appearance, struck on 17 of his first 18 shots of singles. He became the 29th bowler in 114 years of Open Championships competition with multiple 300s on the championship lanes. 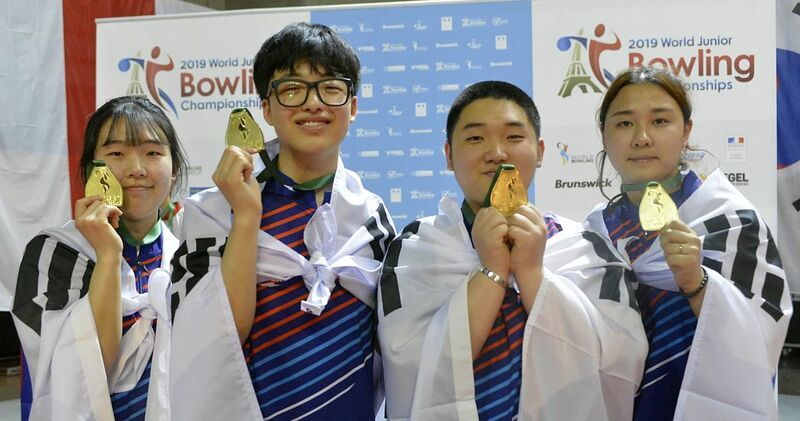 His first came during his team event at the 2014 tournament at the National Bowling Stadium in Reno, Nevada. 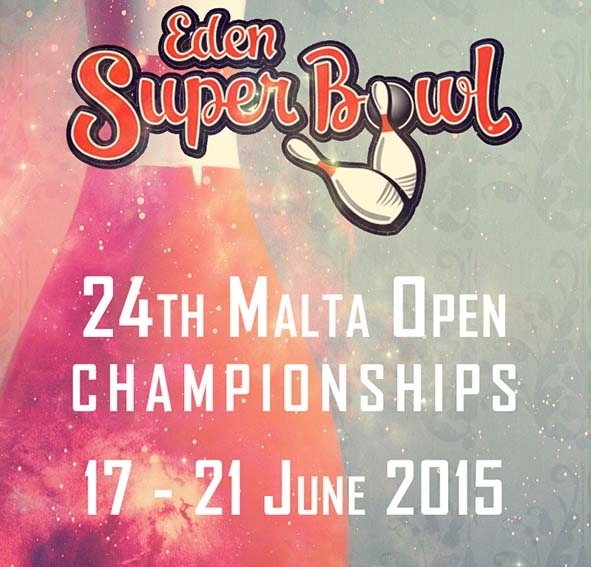 Massie added games of 247 and 222 for a 769 singles series, the best set of his tournament career. He is tied for eighth in Regular Singles. A 657 set in doubles and 569 in team gave him a career-best 1,995 all-events total. 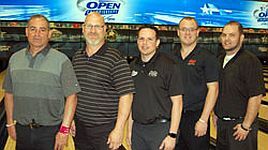 Cole (right) made his first appearance at the Open Championships since 2013, and he celebrated his return to the biggest stage in bowling with a perfect game and the highest series of his 15-year tournament career. 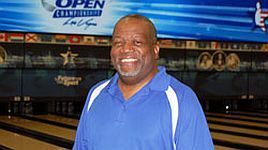 The 58-year-old right-hander is one of a few hundred bowlers pulling double duty this week by competing in the Open Championships and The National Bowling Association (TNBA) Annual Tournament, being held at a pair of local bowling centers. Cole’s singles series included games of 189, 300 and 190 for a 679 total. He added 505 in team and 498 in doubles for a 1,682 all-events effort. USBC Hall of Famer Bill Spigner (above) of Vernon Hills, Illinois, celebrated his 50th year of USBC Open Championships participation May 21. The 67-year-old right-hander was surrounded by friends and family and joined on the lanes at the South Point Bowling Plaza by his two sons, Jim and Robby. He received a plaque, chevron and diamond lapel pin to commemorate the achievement. Spigner’s lone win at the Open Championships came as a member of the Pollard’s Bowl team of Versailles, Indiana, that claimed the 1996 Team All-Events title with a record score of 10,425. The record stands today. This year, Spigner rolled sets of 573 in singles, 541 in doubles and 510 in team for a 1,624 all-events total. In 50 years on the tournament lanes, he has knocked down 93,119 pins for a career average of 203.3. Also May 21, Richard Van Rossem of Canton, Illinois, reached 55 years of participation at the Open Championships. 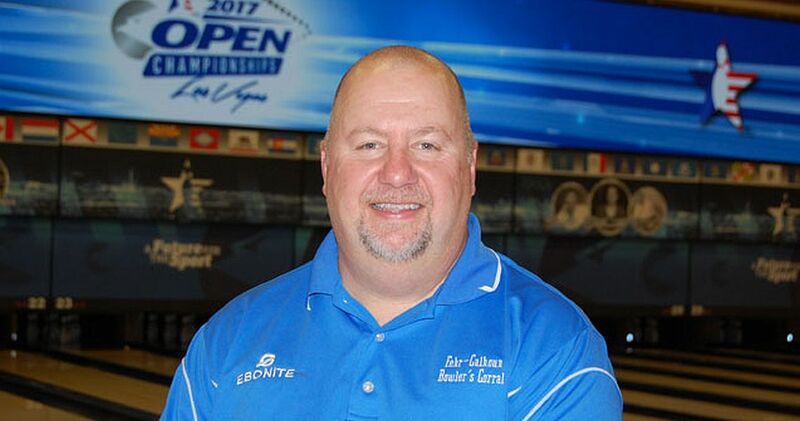 He made his tournament debut at the 1963 event in Buffalo, New York, and has returned to the tournament lanes every year since. He received a plaque, chevron and engraved watch at the South Point Bowling Plaza to commemorate the achievement. 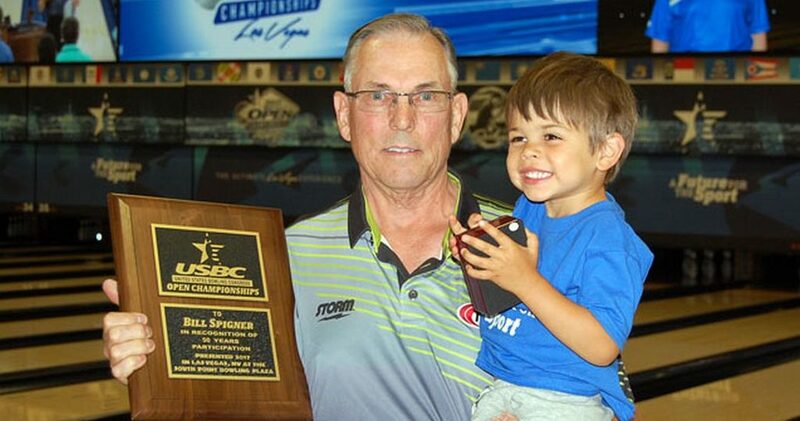 Two more bowlers will celebrate 50 years of USBC Open Championships participation this week at the South Point Bowling Plaza. 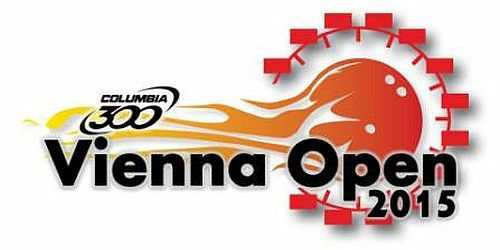 Dennis Lane of Kingsport, Tennessee, will make his milestone march to the lanes May 23, while USBC Hall of Famer Bob Chamberlain Sr. of The Villages, Florida, hits five decades of Open Championships bowling May 25. 1, Team NABR (Adam Barta, Anthony Pepe, Mike Rose Jr., Scott Pohl, Brian Waliczek), Fairport, N.Y., 3,266. 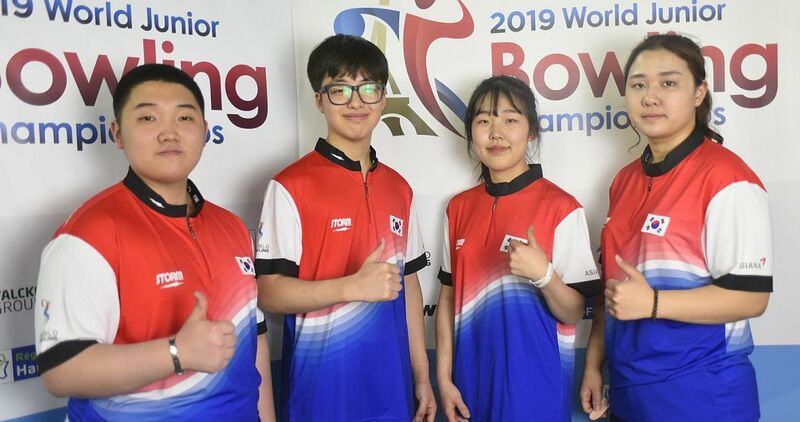 2, BowlingDynamics.com, Phoenix, 3,246. 3, HoF Silver Lanes 1, New Hartford, Conn., 3,239. 4, Kruse’s Pro Shop, Fargo, N.D., 3,198. 5, TJ’s Pro Shop, Beaver Dam, Wis., 3,191. 6, Supreme Deck, Grand Haven, Mich., 3,174. 7, StormEBIMotiv, Cincinnati, 3,168. 8, Rose Bowl Lanes, Rochester, N.Y., 3,167. 9, ND Storm, Glenburn, N.D., 3,161. 10(tie), Chet’s Crew 1, Benbrook, Texas, and The Lakers 1, Brooklyn Park, Minn., 3,160. 1, Jacob Kent/Doug Kent, Newark, N.Y., 1,425. 2, Timothy Pfeifer, Oakdale, Pa./Christopher Bardol, Brockport, N.Y., 1,417. 3, Ryan Zagar, Racine, Wis./Tylor Greene, Davison, Mich., 1,409. 4, Charles Richey, Concord, N.C./Steve Arehart, Chesapeake, Va., 1,385. 5, Jeff Fehr/Kenny Abner, Cincinnati, 1,385. 6, Scott Erickson, Waunakee, Wis./Chris Gibbons, Madison, Wis., 1,378. 7, Michael Kubacki Sr., Griffith, Ind./Sammy Krucek, Hammond, Ind., 1,369. 8(tie), Jonathan Schalow, Evansville, Wis./Chad Svendsen, Monroe, Wis., Chris Hans, Battleboro, N.C./Kyle Troup, Taylorsville, N.C., and Doug Hayes, Clarksville, Tenn./Jimmy Cook II, Indianapolis, 1,365. 1(tie), Matt Gasn, Clarksville, Tenn., and Steve De Kerf Jr., Sheboygan Falls, Wis., 802. 3, Adam Barta, Girard, Ohio, 776. 4(tie), Austin Gratzer, University Place, Wash., and Patrick Girard, Quebec City, 773. 6(tie), Sam Sylvester, Hugo, Minn., and Todd Lathrop, Colchester, Conn., 770. 8(tie), Chris Curry, Indianapolis, and Marc Massie, Alexandria, Ky., 769. 10, Tony Buck, Rockford, Mich., 768. 1, Jacob Boresch, Kenosha, Wis., 2,122. 2, Todd Lathrop, Colchester, Conn., 2,105. 3, Chris Gibbons, Madison, Wis., 2,102. 4, Stuart Williams, Phoenix, 2,090. 5, Tim Pfeifer, Oakdale, Pa., 2,069. 6, Chris Bardol, Brockport, N.Y., 2,065. 7, Jeff Fehr, Cincinnati, 2,055. 8, Kenny Abner, Cincinnati, 2,054. 9, Shawn Naumann, Orlando, Fla., 2,053. 10, Brian Waliczek, Frankenmuth, Mich., 2,051. 1, Team NABR (Adam Barta, Anthony Pepe, Scott Pohl, Michael Rose Jr., Brian Waliczek), Fairport, N.Y., 9,957. 2, Rose Bowl Lanes, Rochester, N.Y., 9,867. 3, Vanilla Salsa, Roseville, Calif., 9,743. 4, Buddiesproshop.com No. 2, Naugatuck, Conn., 9,638. 5, Lakeview Lanes, Baldwinsville, N.Y., 9,635. 6, StormEBIMotiv, Cincinnati, 9,628. 7, Fehr Calhoun Bowlers Corral, Alexandria, Ky., 9,615. 8, High5Gear, Wichita, Kan., 9,596. 9, Every Kiss Begins with Kruml, O’Fallon, Mo., 9,588. 10, Eagle Taxidermy, Vancouver, Wash., 9,541. 1, Minnesota Select Sires 1 (Arvid Strande, Carl Krause, Paul Buendiger, Scott Molnar, Andrew Kasten), Fergus, Minn., 2,922. 2, Chris’ Boys, Livingston, Mont., 2,778. 3, General Distributors 2, Beavercreek, Ore. 2,748. 4, Scotty’s 3, Alexandria, Minn., 2,738. 5(tie), Aztec 4, Lacey, Wash., and Invazn, Columbia, Mo., 2,729. 7, Rimmy’s Pro Shop 2, Oak Lawn, Ill., 2,709. 8, Ten Pins Pro Crew 3, Fremont, Calif., 2,697. 9, Becker’s Pro Shop, Muskego, Wis., 2,696. 10, TNBA Exclusive BC 3, Chicago, 2,694. 1, Stuart Sheck, Germantown, Md./Robert Tonelli, Henderson, Nev., 1,236. 2, Douglas Turney/Brennan Nett, Kiel, Wis., 1,201. 3, Steven Costa, Chicago/Anthony Giannecchini, Hawthorn Woods, Ill., 1,197. 4, Thomas Fredrick/Mark Mallow, Watertown, Wis., 1,192. 5, Ramon Pagan/Raymond Haran, Chicago, 1,191. 6, Nicholas Frederick, Commerce, Mich./Zane Hollander, Las Vegas, 1,190. 7, Danny Smart, Shreveport, La./Jim Daubenheyer, Valparaiso, Ind., 1,188. 8, Debra Barmore, Omaha, Neb./Tim Kightlinger, West Des Moines, Iowa, 1,187. 9, Cody Maier/James Medina, Spring Creek, Nev., 1,180. 10, Michael Barber, Winnemucca, Nev./Benjamin Wells, Old Hickory, Tenn., 1,177. 1, Charlie Theobald, Minot, N.D., 696. 2, Scott Williams, Aberdeen, Md., 681. 3, Nolen Fisher, Caldwell, Idaho, 677. 4, Larry Neb, Loveland, Colo., 674. 5, Earl Bowe, Freeport, Bahamas, 667. 6, Brennan Nett, Kiel, Wis., 665. 7, Jonathon Berg, Bismarck, N.D., 663. 8, Fred Phillips, Richland, Wash., 658. 9, Anthony Holden, Hudson, Wis., 653. 10, Don Thompson, Rio Rancho, N.M., 652. 1, Brennan Nett, Kiel, Wis., 1,865. 2, Nolen Fisher, Caldwell, Idaho, 1,829. 3, Stephanie Sanders, Bakersfield, Calif., 1,826. 4, Timothy Hagar, Celina, Ohio, 1,809. 5, Mike Thielen, Eagle Grove, Iowa, 1,801. 6, Michael Kay, Bolingbrook, Ill., 1,799. 7(tie), David Miller, Menomonie, Wis., and Stanley Chambliss, Opelousas, La., 1,795. 9, Paige Collick, Helena, Mont., 1,788. 10, Paul Chelminiak, Oconomowoc, Wis., 1,784. 1, Scotty’s 8 (Chad Brandt, Ryan Dew, Bruce Corneliusen, Zach Hedine, Alan Iverson), Alexandria, Minn., 2,569. 2, Dusty’s Floor Covering, Twin Valley, Minn., 2,487. 3, Spray And Pray, Los Angeles, 2,486. 4, Brant Construction, Spirit Lake, Iowa, 2,462. 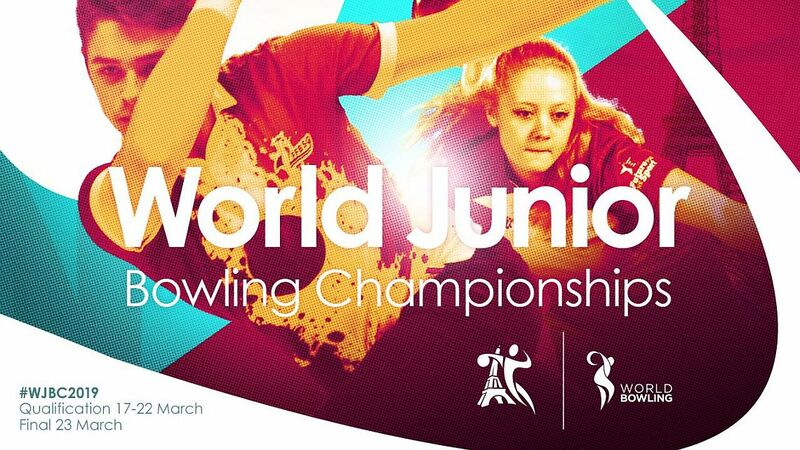 5, WA Bowlers 7, Renton, Wash., 2,459. 6, Kutztown Fire 1, Kutztown, Pa., 2,456. 7, Decorah Auto Center, Calmar, Iowa, 2,437. 8, Wags N Whiskers, Livingston, Mont., 2,436. 9, TNBA OSNM 1, South Holland, Ill., 2,426. 10, Crooked Creek 1 Bar & Grill, Bowman, N.D., 2,413. 1, Ashley Olriksen, Brooklyn Park, Minn./Bud Olriksen, Las Vegas, 1,105. 2(tie), Aaron Hagen/Brody Hagen, Benson, Minn., and Mark Nelson, Clitherall, Minn./Lynn Good, Battle Lake, Minn., 1,102. 4, Cari Wiest/Larry Wald, Wishek, N.D., 1,091. 5. Dalton Mortenson/Jessica Mortenson, Moorhead, Minn., 1,083. 6(tie), Fannie Patterson, Clymer, N.D./Sarah Plecker, Hummelstown, Pa., and Leilani Basinger/Jonathan Greer, Riverside, Calif., 1,069. 8, Cameron Simmonds, DeGraff, Minn./Allen Jackson, Belle Plaine, Minn., 1,064. 9, Jeff Dale/Corbin Flechsig, Caldwell, Idaho, 1,062. 10, Carol Fuller/Jason Ingram, Sioux City, Iowa, 1,060. 1, Nick Stenberg, Big Timber, Mont., 621. 2, Michael Tengan, Hilo, Hawaii, 607. 3, Gary Pettway, Sweetwater, Tenn., 598. 4, Rory Hanlon, Las Vegas, 592. 5, Efrain Rodriguez, New York, N.Y., 590. 6, James Lee, North Platte, Neb., 589. 7(tie), Gregory Lancaster, Port Orchard, Wash., and Tonja Lindbo, Bremerton, Wash., 587. 9, Cody Maier, Spring Creek, Nev., 584. 10, Jonathan Eickhoff, Belding, Mich., 583.